1992 was an awesome year for the WWF. Still one of my all time favorite years of pro wrestling ever. Flair won the title in still to this day remains one of the best Royal Rumbles EVER, Randy Savage won the title at WrestleMania 8(from Flair). Undertaker, Shawn Michaels, Razor Ramon, and Bret Hart started getting pushed heavily to the moon and thanks to great matches being put on by all, my interested was at an all time high. So naturally, because I was a huge fan of pro wrestling, that year I had to be a wrestler. I wasn't gonna prance around in Shawn's goofy looking chaps and jacket. And I couldn't get a pair of Hitman shades in time. Finding a Randy Savage hat and outfit was also going to be a challenge as well. And while I was a huge fan of Roddy Piper, walking around in a skirt was not my idea of fun at that age. So, that left me with one option. Yup. 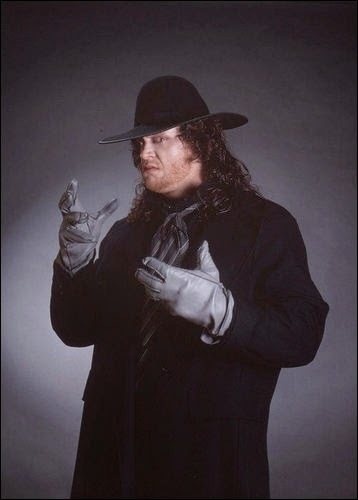 The Deadman himself. Ol' Mean Mark was getting popular pretty quickly by the time he arrived in the WWF. Even though he was presented as a villain, he was getting cheered more and more everytime he came out. So by 1992, he was one of the WWF's most popular stars. And at that time, he was just so cool. He wasn't like heroes before who yelled and screamed nonsense about putting away the dishes. Nope, he just throw guys on their and stuffed them in a bodybag. So, with a little help from the thrift store, I went from normal 9 year old boy to Phenom! The picture above is kind of awesome. Despite my slack jawed stare, dressed like the Undertaker reading a WWF magazine with the Undertaker appearing in the pages is rather good timing on my moms part. If you look at the top of this photo and in the background of the previous photo, you'll also see a McBoo pail from that year. My mom collected Halloween pails in general of the years so we never truly ran out of methods of trick or treating. Also, there's a horribly painted pumpkin that I did in art class that year, but uh...just ignore that. It looks like a bottle of paint and glitter threw up all over a pumpkin. Now, this was a pretty decent costume. 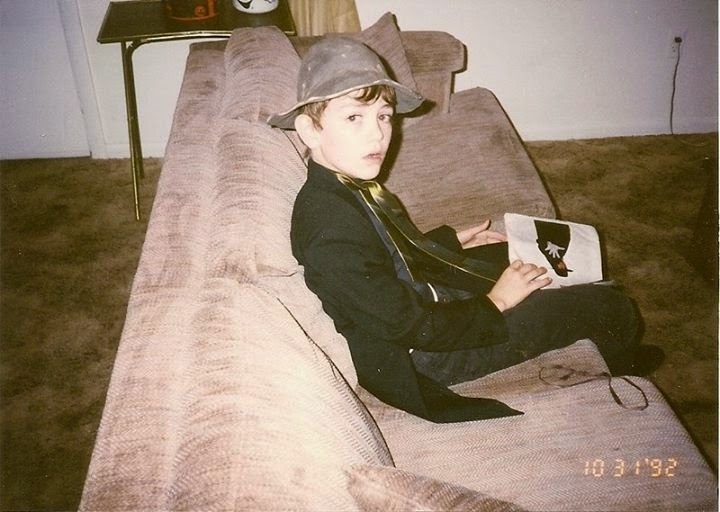 Unfortunately it was overshadowed by my friend at the time and co-trick or treating partner, Danny Thrift. 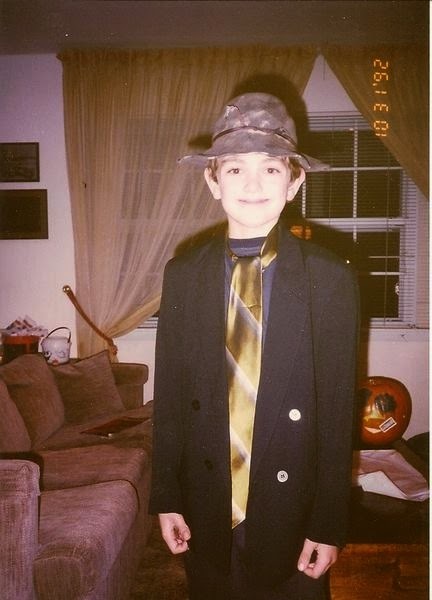 Danny always stole the show at Halloween. The year before he was a Treasure Troll. It was fantastic. So fantastic, I totally forgot what I was that. This year Danny was Urkel and got all Urkel's mannerisms down pat. From his awkward walk to the Urkel Dance to the laugh and snort, he was the king. This came in handy though, as his dedication scored us more candy than we could handle. If my memory serves me correctly, people would give us extra candy if he did the Urkel dance and I would do imitate the Undertaker's voice. As weird as it sounds, The Undertaker and Urkel was an unbeatable tag team that night. Later that night we had a sleepover, as it was a Saturday, and discussed our amazing scores and watched Halloween specials on CBS and ABC. It was a pretty successful Halloween but my only regret is that there is no photo of Danny as Urkel. His mom took more photos but my mom ran out of film. A shame, because I'd love to find that photo of me and Danny as the unstoppable tag team of Urkel and Undertaker. Maybe if we were in the WWF we'd be called "Urkel-Taker"? Who knows. We both may have missed our calling. Photos of no photos, it was a spectacular time to be a kid. And this Halloween summed up everything about the early 90s that mattered to me and my friends. Wrestling and TGIF. I don't know if any Halloween as a kid can truly follow that one up! Well, there is that Halloween where I was Sgt. Slaughter, but that can wait.